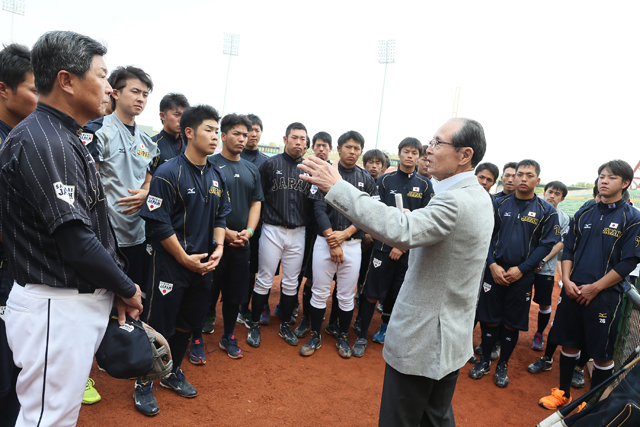 Australia played their first game of the 21U IBAF World Cup today, and despite succumbing to a powerful Japanese team 9-7 they can hold their heads high. 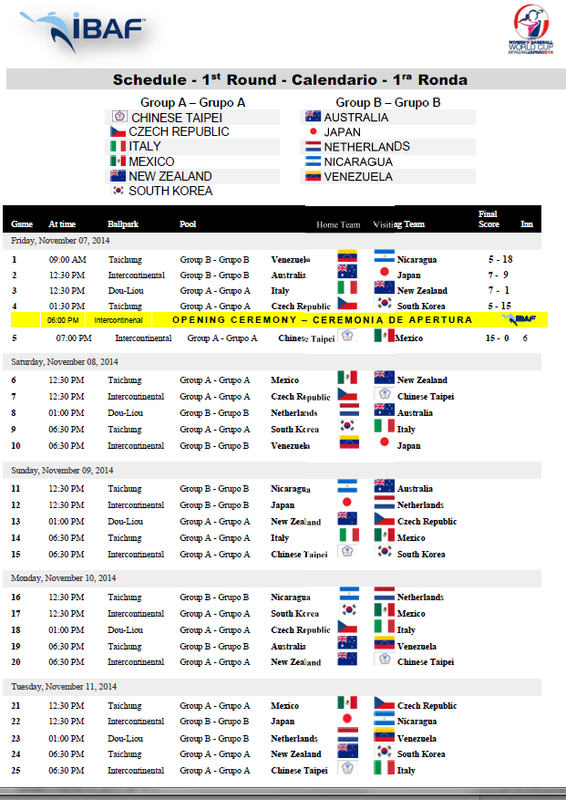 Even though Japan jumped out to an early 5-0 lead in the top of the first, Australia fought back and staged a great comeback. 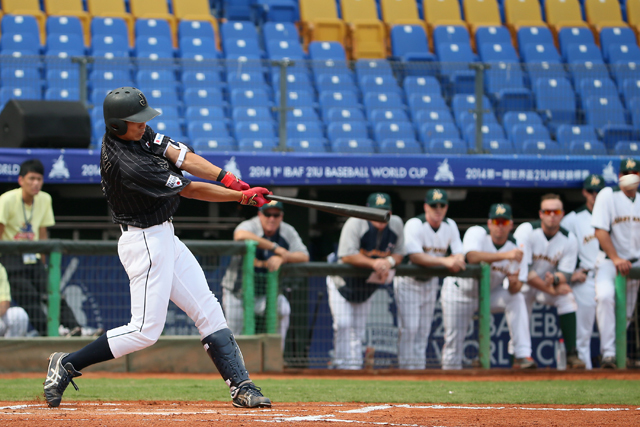 Once starting pitcher Aaron Sookee settled down, and with some sparkling infield defense, Australia almost secured the victory against world ranked number 2 Japan. A triple from Guy Edmonds and an RBI from Robbie Perkins put Australia on the board in the 2nd. Australia loaded the bases in the 4th with singles from Jacob Younis, Ben Lodge and Guy Edmonds. Japanese pitcher Masura Nakamura then lost a fastball inside hitting Connor MacDonald, which scored the second run for Australia and started a five run inning. Ryan Dale kept the inning alive by singling to right field off a 97km curve ball to score Lodge and Edmonds, with MacDonald crossing the plate on a wild pitch to knot the score. The lead was secured off a ground rule double from Ben Leslie, and after a final strikeout the inning ended with a 6-5 lead for Australia. The 5th saw Australia extend their lead with a run to push ahead 7-5. With two outs Shepherd singled to centerfield, Edmonds walked and with runners at 1st and 2nd, a single from Perkins scored Shepherd on a close play at the plate. With one out Japan added a run in the 6th off a triple from Seiya Suzukis, followed by a ground ball out to bring the score to 7-6. Aaron Sayers made a nice play up the middle to end the inning on a force at 2nd. Japanese left hander Yuma Yokoyama came in to pitch breezing through the 6th, 7th and 8th striking out 8 while dominating the Australian hitters with a 4-pitch mix. Sam Holland came in to pitch the 7th for Australia and retired the side 123. Sam Street followed Holland in the 8th, retiring the lead off hitter on a ground ball before a single put a runner at 1st with one out. Street quickly induced a ground ball double play, slickly turned from Younis to Sayers and on to MacDonald to end the inning. Closer Todd Van Steensel pitched in the 9th, eventually giving up 3 runs after retiring the first batter on a weak ground ball to 2nd. Walks put runners at 1st and 2nd, and a double over Leslie's head in right field saw the tying run cross the plate. A single to right drove in the go ahead run and a single to left made the score 9-7 Japan at the end of the frame. Japan's Ryosuke Nomura closed the door to give Japan a come from behind 9-7 win over a young Australian team that fought their way back into the game despite striking out 17 Times. 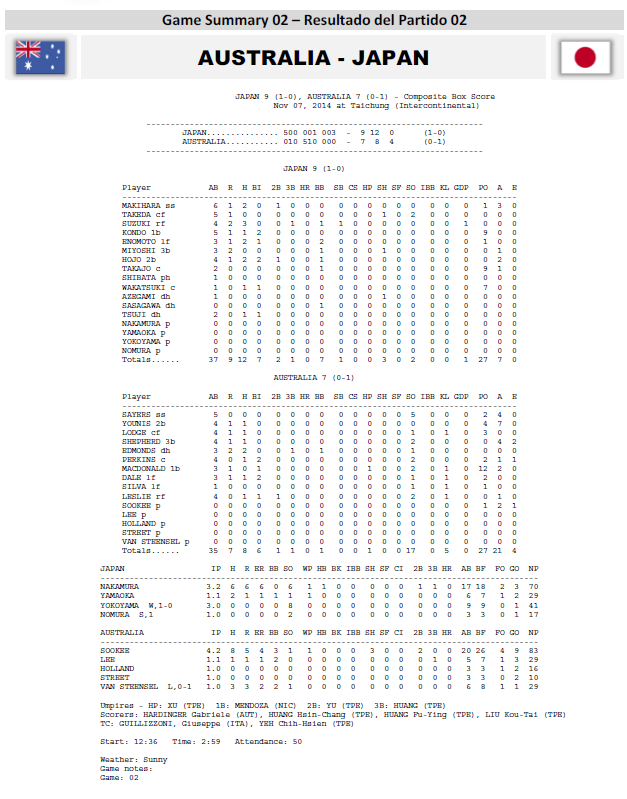 Australia was able to plate 7 runs with some timely hitting fighting back from a 5-0 deficit to lead going into the 9th.